Last night we saw another British heavyweight fail to bring the heavyweight title away from the champion and back to Britain. Finchley’s Dereck ‘Del Boy’ Chisora went over to Munich in an attempt to become the first man to beat Vitali Klitschko since Lennox Lewis in 2003. But the actual fight was a lot more competitive than I expected. On the scorecards Chisora only won one or two rounds. But I’d say he was competitive enough to win three or four rounds from the fight. Chisora’s best portion of the fight was the middle rounds when it looked like Chisora’s body shots were having an effect on ‘Dr Iron Fist’ who didn’t seem like his normal self in the ring. Even though Chisora gave Vitali his toughest fight since Lennox Lewis, Vitali still did more than enough to outbox Chisora and win on the scorecards. However the action didn’t stop there. At the post fight press conference David Haye and Dereck Chisora exchanged blows and both their trainers Adam Booth and Don Charles got involved as well. If you want to look at the press conference brawl then type it into YouTube. Stephen Smith got back to winning ways by scoring a first round TKO victory over Arpad Vass. Johnathan Banks outpointed Nicolai Firtha in a twelve round fight. Also on Saturday night (Sunday morning for UK fight fans) were Tavoris Cloud Vs Gabriel Campillo and Paul Williams Vs Nobuhiro Ishida. Let’s start with the co-main event. Unbeaten Tavoris Cloud successfully defended his IBF light heavyweight strap for the fourth time by beating Argentinian Gabriel Campillo. Campillo has been on the wrong end of some controversial decisions in the past. 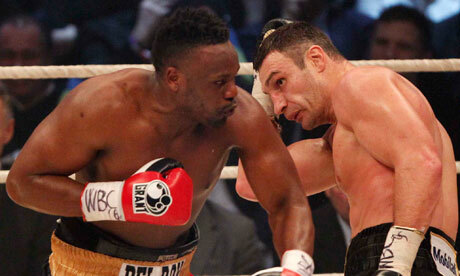 Most notably his loss to Beibut Shumenov and draw to Karo Murat. Unfortunately for Campillo another controversial loss was added to his resume. Campillo was knocked down twice in the first round due to the hard hitting Cloud, but after the perfect first round Cloud seemed to have let Campillo off the hook. Campillo got himself back into the fight by using fast but soft hitting combinations; Cloud had no answer for Campillo’s fast hands. The fight was a carbon copy of the Joe Calzaghe/Jeff Lacy fight in parts. Tavoris Cloud remains a very exciting fighter and a good one at that, but he didn’t win the fight last night. The main event saw the return of Paul ‘The Punisher’ Williams after a seven month layoff and he took on Nobuhiro Ishida. Annoyingly for me the live stream which I was watching the fight on suddenly stopped working half way through the fight so I don’t have much to say about the action. But Paul won a unanimous decision with all three of the judges’ scorecards reading 120-108 for Williams. One thing I will say about the action is that at one point during first half of the fight it seemed like Williams knee’s buckled at one of Ishida’s punchers. We all know that Williams is not at his very best but you question the punch resistance of Paul Williams because I can’t imagine the Paul Williams who fought Antonio Margarito having his knee’s buckled by a Nobuhiro Ishida punch. American heavyweight Chris Arreola scored a first round knockout victory over Erik Molina. Former Kelly Pavlik opponent Alfonso Lopez lost his third career fight to journeyman Justin Williams. 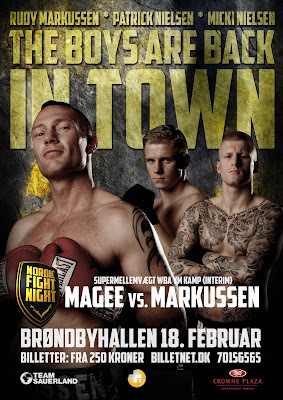 And finally we also saw Irishman Brian Magee defend his WBA interim belt against Rudy Markussen. Magee kept his dream alive of becoming a world champion by scoring a knockout victory in the fifth round when he put Markussen to the canvas on a body shot. Magee has been talked about as a possible opponent for super six winner Andre Ward, but I doubt that will happen. This wasn't the only knockout of the night. Patrick Nielson knockoed out his opponent Jozsef Matolcsi in the first round. Chris Eubank Jr won his second pro outing in a fight where he looked less than impressive. Eubank Jr injured his right hand before the fight. This seemed to have an effect on Eubank Jr's performance in the ring. Kid Galahad overcame an early knockdown to outpoint veteran Jason Booth over twelve rounds. And finally Lenny Daws won his second fight since losing to Ashley Thepophane last year. To sum up, none of the underdogs won in any of the fights last night. Although one of the underdogs morally won their fight. We saw some good exciting fights, a controversial decision, and pre fight and post-fight action. Just another week in boxing. Bring on next week.